Habitat: Canyonlands, badlands, swells, and reefs within the Colorado Plateau region of Central and Southern Utah, SE Colorado and Northern Arizona. Click here for more information on Utah populations. Finding habitat is not always sufficient for locating this butterfly. It is also critical to find the larval host plant as these can grow intermittently throughout the habitat. Methods of Female Oviposition: Open Screen Cages; This brief video shows a female indra laying an egg in an open screen cage. How to Find Eggs: Eggs on Peripheral Stalks; (Although this doesn't apply to some populations of P. i. minori.) Seek out host plants that are exceptionally healthier than other sun-scorched plants within a population. 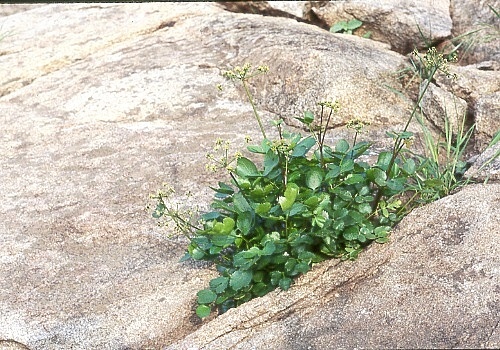 Many of these plants are growing in washes or at the base of a wash next to a reef; creating healthier roots than other plants. Females will lay eggs on these types of plants. Caterpillar setups: For first through fourth instars, I recommend using the Open terrariums or Open Bucket technique. If you're only rearing a few fifth instar caterpillars, I recommend using a Closed Container--Papilio indra. For more information, please see this video to see why I recommend using a closed container for later instars. Field Notes: Dr. Wayne Whaley has done extensive research on the entire Papilio indra complex. Click here for section on Papilio indra minori.